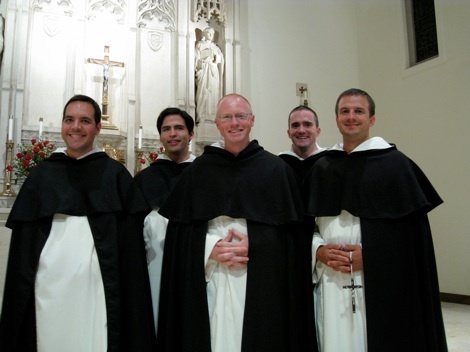 This year (and probably the next) the Southern Province and Western Province of the Dominican friars in the USA will share a novitiate at St Dominic's in San Francisco. The SDP elected its newly appointed novice master as Prior Provincial back in June, thus leaving us w/o a trained novice master. The novices of the Southern and Western Dominican Provinces. . .
Kevin (WDP), and Dennis (WDP). Br. Thomas More Barba (a.k.a. Rudy Barba) is a former student of mine at U.D., and he served in Campus Ministry as my intern for a year. Unfortunately, I do not know the other novices. . .yet! Please keep this young OP's in your prayers. . .
NB. If this homily seems like it's somewhat truncated that's b/c it is. When I was assigned last evening's Mass, I naturally starting thinking about it as a vigil Mass. . .thus, a 12 min. homily would be required. Then I learned that the 6.15pm Saturday Mass here is not a vigil Mass, i.e. it is not celebrated using Sunday's readings, etc. So, much slashing and burning had to be done! If asked, could you sum up the basic differences between cultural modernism and cultural postmodernism? The difference between T. S. Eliot and Julia Kristeva? Fredric Jameson argues that postmodernism is the "dominant cultural logic of late capitalism,” meaning that the logic of our current cultural enterprises is motivated by a pernicious ideology that privileges textuality over ontology, difference over unity, skepticism over certainty, and intellectual anarchy over reason's authority. My guess is that most sensible people don't spend a lot of time worrying about the postmodernist deconstruction of modernism's grand-narratives of Self, Law, and Reason. Sensible people, including not a few good Catholics, need to reconsider. . .and worry. Why? Take a simple definition of one of postmodernism's most successful spawn, Jacques Derrida's theory of deconstruction. J. Hillis Miller writes, “Deconstruction is not a dismantling of the structure of a text, but a demonstration that it has already dismantled itself. Its apparently-solid ground is no rock, but thin air." What's so worrying about how a critic chooses to treat a literary text? If we were simply talking about poetics, there might not be a problem. However, the notion that there is no solid ground, no rock upon which we might construct a humane community is the originating principle of the logic that governs many of our contemporary cultural, economic, political endeavors, including efforts among some in the Church. As a culture, what do we inherit and what do we bequeath? Well, all is thin air. But it doesn't have to be. Jesus says to his disciples, “I will tell you about the person who hears me and acts on my teachings. . .” He then describes two house builders. The one who listens and acts is like a builder who digs a deep foundation for his house and build on solid rock. The one who listens but fails to act is like a builder who builds his house on sand. When the river rises and bears down on each house, guess which one ends up starring in a Youtube video as it slides gracelessly into the flood? The house with no foundation, the one built on sand collapses. Jesus exclaims, “. . .and what a ruin that house became!” The person who hears but does not act will collapse into ruins when a crisis strikes. One person, then the family, then the community, then the nation, then the whole of one's culture. What will we inherit and what will we bequeath? Thin air. All is thin air. In his first letter to the Corinthians, Paul warns the Church of Corinth to avoid idolatry not because the idols are real gods but because the idols are not the real God. If we make an idol of the logic of late capitalism, then language is simply arbitrary convention; law is simply violence made legitimate; reason is simply privileged power; and faith, faith is nothing more than a vicious habit, the naive and potentially dangerous habit of believing that there is Something Out There worthy of our trust. It is no accident that the scions of postmodernism target the Church for ridicule and oppression. We are among the last to dig deep and build on a rock-solid foundation. Our foundation is Christ and him crucified and risen; therefore, we cannot eat and drink with Christ in the Church and at the same time eat and drink with demons. Through the Church, we have inherited the faith of the apostles, and we have been charged with bequeathing this treasure to our children. They are no less endangered by the raging floods than we are. And they are no less entitled to the riches of an authentic faith than we are. After all, Jesus says to his disciples, “There is no sound tree that produces rotten fruit. . .we do not pick figs from thorns.” With constant prayer, charitable works, attention to the sacraments, and obedience—listening—to the voice of divine love and acting on His love, we dig deep, rock solid foundations. The thin air of late capitalism's cultural logic is no match for a Church built on the rock of Christ. Additions to W.L. not working. . .
A HancAquam reader tells me that the changes I made to the Wish List have made things worse. With Amazon my shipping address is automatically included. The Book Depository additions to the Wish List do not. So, I've switched most of the recently added books on the list back to Amazon. Ah well, it was worth a try! The John Carroll Society announces. . . The Cathedral of St. Matthew, Washington, DC at 6:45 p.m.
On not spending $40K a year to get a degree in Gender Studies. As a holder of several degrees in "useless majors" (philosophy, history, English, and theology), I can attest to the wisdom of both a liberal arts education and the need to spend your young adult years studying more practical subjects (NB. my first major was International Banking!). However, some of us simply aren't made for the practical world. . .ya know, where math and stuff is required. . .
On the persistence of Presidential petulance: "Messianic disappointment with an unappreciative lesser world can explain a lot." The Ground Zero Mosque imam: Making us move the mosque will increase threats to US national security. Ummmm. . .veiled threats to our national security will not garner you much sympathy. Another one of our Black Robed Masters orders us to do what's best for us. NB. the DoJ did nothing more to defend the law than present its legislative history, i.e. they called no witnesses, produces no evidence, made no arguments. Wonder how many stories we will see about this revelation in the MSM: Castro admits that communism/socialism has failed in Cuba. LA cathedral will the site for the campaign kick-off of CA's pro-abortion/pro-gay "marriage" Democrats. In all of CA, is there no where else for them to go? Surely, the Vulcan Princess statue (a.k.a, the Blessed Mother) will be frowning. This is why you shouldn't play with Ouija boards. . .
Fido just finished watching Inception. . .he'll never be the same. A fantastic quote from Dominican legend, Fr. Reginald Garrigou-Lagrange, O.P. . .
"The Church is intolerant in principle because she believes; she is tolerant in practice because she loves. The enemies of the Church are tolerant in principle because they do not believe; they are intolerant in practice because they do not love." Yes! Because going on strike creates money! No doubt after today's "worker action" gov't budgets all over the E.U. will magically balance. Geez. Someone put the adults back in charge, please. Catholic dinosaurs in the U.K. are thwarted in their ridiculous attempts to foist a Spirit of Vatican II liturgical agenda onto the Holy Father's visit. OK then. . .Time Magazine is no longer simply hinting at its barely disguised antisemitism. The Eternal Shrug of Rome. . .wow, she nails it perfectly! Trust me on this: orthodox Catholics do not want the Vatican to be in any city other than Rome and we want no one else to be running things but the Italians. God is in charge and the Italians in the Vatican seem to understand this. Ouch! Priest slaps young man for desecrating the Blessed Sacrament. Not sure I could do that, but I have often wanted to smack some people for wearing halter tops and hunting gear to Mass. On burning the Koran in FL. . .remember: just because you have the right to do something doesn't make doing it right. The definition of insanity: doing the same thing over and over again and expecting a different result. This is what happens when you don't or won't understand history. I repeat: someone please put the adults back in charge! The definition of irony: school named after Pope Gore I built on toxic soil. Finally! Universities are teaching something our citizen-students can use: Zombies 101. I hope there is a lab on the use and care of machetes. Sometimes, he grabs a boat and rows out to sea. Other times, he heads out into the desert, fasting and praying. He usually goes alone, but occasionally he takes along a select group of disciples. This time, with a largish gang of students trailing behind, Jesus goes out into the hills. There, among the rocks and sage brush, he spends the whole night in pray to God. We might wonder what's so special about the sea, the desert, and the hills when it comes time for Jesus to pray. Surely, he could just as easily find a quiet coffee shop or nice bookstore. Maybe a side chapel or park bench. What do seas, deserts, and hills have going for them that a serviceable college library carrel doesn't? Setting aside the anachronisms loaded into this question, let's take seriously the idea that prayer needs a location, a location specific to listening. If, as Aquinas teaches, “Christ's actions are our instructions,” what do we make of Jesus' tendency to flee to remote places in order to listen to God? First, there's the obvious advantage of silence. Being in a quiet place is a kind of fasting, a sacrifice of music and noise. Whether your preferred noise is Mozart or Moby, Johnny Cash or Johnny Rotten, filling your ears symphonically or cacophonously can push out the Word you need to hear. Patterns become familiar. Rhythms become predictable. Lyrics repeat what you already know. Silence has no pattern, no rhythm, and its lyrics never repeat. It is the surprising strangeness of no-sound-at-all that smacks us awake to the long, novel reach of every possible sound. When it comes time to pray, the second advantage that deserts and hills have over parks and malls is solitude. Like silence, chosen solitude is a form of fasting, sacrificing the company of family and friends in order to clear a time and space to entertain the presence of God. Filling every space in our days with someone else, with just anyone else, edges God out, leaving Him aside like an unfashionable handbag or a particularly ugly hat. The presence of people in our lives, however well-meaning and precious, can become too predictable, patterned and repetitious. Their familiarity and our comfort with them can distract and disarm, leaving us unable or unwilling to risk the dangers of being alone with God. What might He ask us to do? What truth might He reveal? Without family and friends to normalize these potentially bizarre revelations, we are left to wrestle single-handedly whichever angel God chooses to send. Time alone with God in silence demands responsibility. Not just the moral kind, the kind where we are held morally accountable, but the kind where we are compelled to respond, seduced into answering Him. Without noise and companions to distract, disarm, normalize, and comfort, we have nothing and no one to fall back on when the weight of a decision presses in. What we say is ours alone to say. What we do is ours alone. Note well, however, Jesus always returns to the crowd; he always goes back to his disciples. He never just abandons the people he loves. He takes the silence and solitude of the deserts and hills and seas back to the madness of the crowds and to his questioning students. He shares out the fruits of his prayer, knowing that every mountain good for contemplation comes complete with level ground for preaching. Christ's actions are our instructions; therefore, pray alone in silence and then tell the Church what God has revealed to you. It just might be that the rest of us, noisy and busy, haven't been listening. Q: Father, it seems like all the major Catholic charities are giving our money to groups that promote various sins. Is it possible to give money to these charities and justify the donation by saying that the good they do outweighs the evil? A: Let me answer your question with a question. You discover a large cockroach in your bowl of soup. Do you just eat around the cockroach? Or do you believe that the cockroach swimming in your soup has tainted all the soup in the bowl? Unless and until you can conclusively prove that the cockroach's diseased presence has inflected only a small, removable portion of the soup, I say: throw the whole thing out and start over. In case you are one of the three Catholics in the US who do not read Whispers in the Loggia, I've reposted below Rocco's post on the new Master of the Order of Preachers, Fr. Bruno Cadore. I'm reposting the whole thing b/c I can't figure out how to link to the post from WITL! 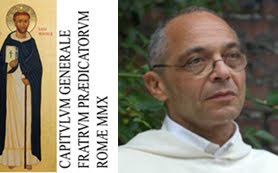 For the 290th time, one of the church's most storied religious communities convened in General Chapter last week in Rome… and early this morning saw the highlight of the Dominicans' signal gathering: the election of a new Master of the Order, the ballot going to the French provincial, Fr Bruno Cadoré, who now becomes the 86th successor of St Dominic. The new Master inherits a community of some 7,000 men in 88 countries, who work in apostolates ranging from parishes to the Papal Palaces and, of course, the classroom -- its hallmark mission-field -- with the order either providing campus ministry at or operating hundreds of universities worldwide. Held every three years, the current Chapter has outlined its work in four questions on its mission, with an eye to the 800th anniversary of the order's confirmation by Pope Honorius III come 2016. This year likewise marks the 500th anniversary of the Dominican presence in the Americas… and appropriately enough, the community's East Coast province recently made a splash by welcoming its largest novice class in almost a half-century. Back at the Chapter, meanwhile, it's been nearly three decades since a Master of the Order hailed from French roots. NB. That's the Rev. Br. Lawerence Lew, OP with the new Master. Br. Lawrence is in Rome, serving as one of the Chapter's chroniclers. Running hard from B.O. Care: ". . .it appears that no Democratic incumbent — in the House or in the Senate — has run a [pro-ObamaCare] TV ad since April. . ." Heh. I wonder why? Racist, sexist GOP gubernatorial candidate with Tea Party ties chooses a black woman as a running mate. Well, she's a conservative black woman with a military background. . .so she doesn't really count, does she? More on the Discovery Channel's Warmabomber's violent eco-terrorist rhetoric. (Aside: "Warmabomber"! You gotta love the creativity of the internet's denizens). On the rise of antisemitism in Europe. . .
Hey, they may be Zombies but they gotta follow the law just like the rest of us living, non-brain eating folks. Is the Grand Design [i.e. The Theory of Everything] Within Our Grasp? Probably not. Glenn Reynolds of Instapundit quotes philosopher, J.B.S. Haldane: “Now my own suspicion is that the Universe is not only queerer than we suppose, but queerer than we can suppose.” Sounds about right to me. John Allen (from the execrable NCReporter) answers four common media questions about the Holy Father's visit to the UK. "Her hair glistened in the rain like nose hair after a sneeze". . .really bad analogies. T-shirt quotes: "Time flies like an arrow. Fruit flies like a banana." 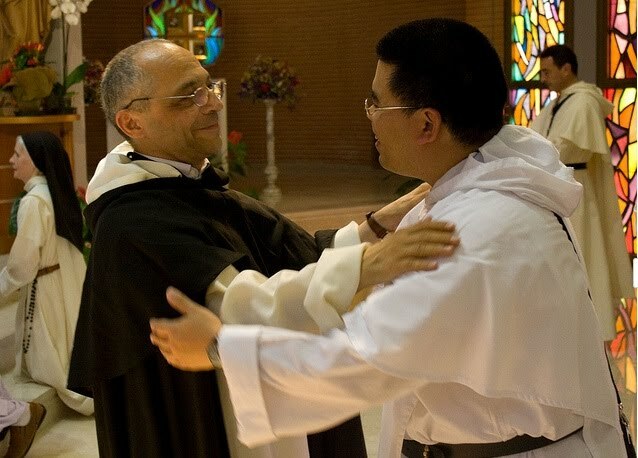 86th Successor of Saint Dominic: Fr. Bruno CADORÉ, OP! Fr. Cadore is a bio-ethicist. He has served as student master and prior provincial of the Province of France. Please pray for him as he begins a nine-year term as our Master. Here's a great Youtube vid on the Chapter. My friend and OP brother, Fr. Alejando Croswaithe is interviewed. He says one very funny thing. . .when describing how the Master is chosen, Fr. Croswaithe says that the friars gather and name brothers that they think should be considered. He says that the friars "offer a short sentence" on why the brother should be chosen as Master. Dominicans offering a short sentence? BAWAHAHA!!! Jesus is preaching on the Mount of Olives. The crowd is huge. The wind is high. It's difficult to hear him clearly. He says, “Blessed are the peacemakers.” A man in the crowd shouts out, “What did he say?” Another man, Gregory by name, responds, “I think it was 'Blessed are the cheesemakers. '” His wife asks, “Aha, what's so special about the cheesemakers?” Gregory explains, “Well, obviously it's not meant to be taken literally; it refers to any manufacturers of dairy products.” Thus do we have—from Monty Python no less—one of the first instances of Jesus' teachings being read through a hermeneutics of inclusion! Of course, this is meant to be funny; it is also meant to point out our very human tendency to take something we've heard and give it the most benign, the least personally demanding interpretation possible. Today's gospel offers us this opportunity as well. Jesus says, “If anyone comes to me without hating his father and mother, wife and children, brothers and sisters, and even his own life, he cannot be my disciple.” To add insult to this familial injury, Jesus adds, “. . .anyone of you who does not renounce all his possessions cannot be my disciple.” So, in order to follow Christ, we're to become homeless, destitute haters of our family. Unless we are willing to “mishear” this difficult teaching, and give it some milquetoast interpretation, we have to deal with it head-on. What are we to make of Jesus' rather unambiguous demand for our radical dispossession? What will it take for you to complete the course? Jesus tells us what we must be prepared to surrender, surrender everyone we love and everything we own. Nothing and no one we love can be loved apart from or before Love Himself. We might ask the question this way: who or what are you unwilling to sacrifice for Christ's sake? Name it. Name him or her and you will know who and what stands between you and your discipleship. Is this too harsh? Too difficult? We could do our best Monty Python imitation and pretend that Jesus says that we must renounce all our obsessions or all our professions. Or that we must come to him rating or baiting our family members. We could say something like, “Oh, he doesn't mean that literally. . .what he really means is that we shouldn't be greedy; we shouldn't let our parents control us.” What he says is that we must choose him over all those we love now, over all the things we love now. This is the cost of our tuition on the Way. Why? Because one likely consequence of following him is the loss of all we love.